And that's a wrap, everyone. We knew this day was coming and it’s finally happened. 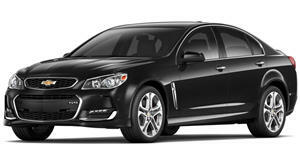 The very last V8-powered Chevrolet SS sedan has just rolled off the production line in Australia, according to Motoring. During its lifetime, the SS was built alongside the Australian market Holden Commodore, which is also being retired. A grand total of 12,953 Chevy SS sedans were exported to the US during its lifetime, along with an additional 7,305 Caprice sedans, specifically as Police Pursuit Vehicles, aka cop cars. In the last year of production, 4,008 SS sedans arrived in the US, but as we’ve seen over the past couple of months, even some killer incentives didn’t bring in a lot of last-minute buyers. As for the last Chevy SS itself, it’s reportedly equipped with a six-speed manual and has a black exterior. And yes, it was built-to-order. "Just as the vehicle was being produced, the Holden manufacturing team received a request from a US customer, asking the manufacturing employees to sign their Chevrolet SS," Holden stated. Of course they agreed to do so, as their signatures are now under the hood and an on the deck lid carpets. And that’s a wrap. Goodbye Chevrolet SS (and Holden Commodore). It’s simply too soon to say goodbye.